The Grandpa & Grandma's Place grandparent sign is built in our workshop. The grandparent sign is made of four cedar boards. The sign is hand painted with Kilz House Paint and durable craft paint. Then the piece is sealed with an acrylic sealer. The top board says Grandpa & Grandma's Place open daily. The top board can be changed to say anything you like as long as it is appropriate. To change the language please contact us through our Contact Us page. The second board says Kids spoiled here. The third board says Cookies & Milk. The fourth board says Stories from long ago. Lettering, colors, and size may vary as it is hand made. The total height is 36 inches. The top board is 5.5 inches tall by 18 inches wide by 2 inches deep. The three bottom boards are 4 inches tall by 11.25 inches wide by 2 inches deep. The total dimensions for shipping purposes are 36 inches tall by 18 inches wide by 3 inches deep. The piece is shipped disassembled. The sign weighs 3 pounds with packaging. For the continental U.S. shipping and handling is included in the listed price. For shipping outside the continental U.S. please contact us through our Contact Us page. 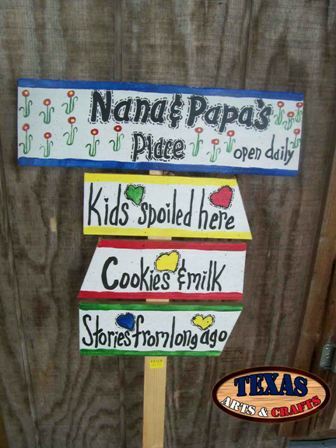 The Nana and Papa’s Place grandparent sign is built in our workshop. The grandparent sign is made of four cedar boards. The sign is hand painted with Kilz House Paint and durable craft paint. Then the piece is sealed with an acrylic sealer. The top board says Nana and Papa’s Place open daily. The top board can be changed to say anything you like as long as it is appropriate. To change the language please contact us through our Contact Us page. The second board says Kids spoiled here. The third board says Cookies & Milk. The fourth board says Stories from long ago. Lettering, colors, and size may vary as it is hand made. 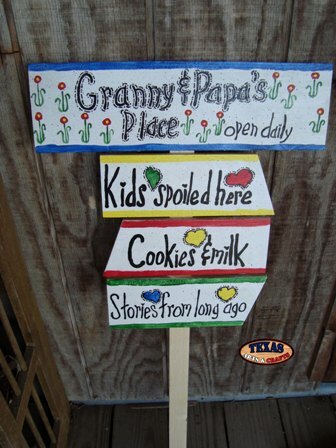 The Papa’s Place grandparent sign is built in our workshop. The grandparent sign is made of four cedar boards. The sign is hand painted with Kilz House Paint and durable craft paint. Then the piece is sealed with an acrylic sealer. The top board says Papa’s Place open daily. The top board can be changed to say anything you like as long as it is appropriate. To change the language please contact us through our Contact Us page. The second board says Fishing Trips. The third board says Tractor Rides. The fourth board says Stories from long ago. Lettering, colors, and size may vary as it is hand made. The total height is 36 inches. The top board is 5.5 inches tall by 18 inches wide by 2 inches deep. The three bottom boards are 4 inches tall by 11.25 inches wide by 2 inches deep. The dimensions for shipping purposes are 36 inches tall by 18 inches wide by 3 inches deep. The piece is shipped disassembled. The sign weighs 3 pounds with packaging. For the continental U.S. shipping and handling is included in the listed price. For shipping outside the continental U.S. please contact us through our Contact Us page. 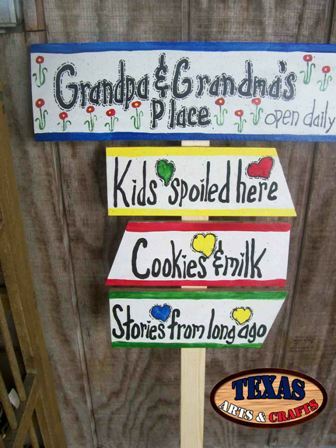 The Granny and Papa’s Place grandparent sign is built in our workshop. The grandparent sign is made of four cedar boards. The sign is hand painted with Kilz House Paint and durable craft paint. Then the piece is sealed with an acrylic sealer. The top board says Granny and Papa’s Place open daily. The top board can be changed to say anything you like as long as it is appropriate. To change the language please contact us through our Contact Us page. The second board says Kids Spoiled Here. The third board says Cookies & Milk. The fourth board says Stories from long ago. Lettering, colors, and size may vary as it is hand made. 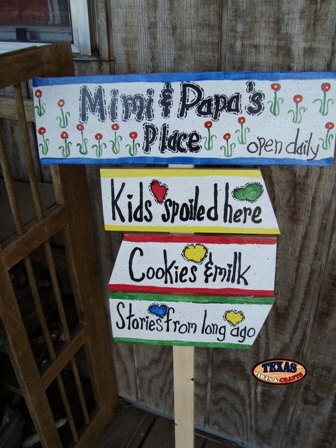 The Mimi and Papa’s Place grandparent sign is built in our workshop. The grandparent sign is made of four cedar boards. The sign is hand painted with Kilz House Paint and durable craft paint. Then the piece is sealed with an acrylic sealer. The top board says Mimi and Papa’s Place open daily. The top board can be changed to say anything you like as long as it is appropriate. To change the language please contact us through our Contact Us page. The second board says Kids Spoiled Here. The third board says Cookies & Milk. The fourth board says Stories from long ago. Lettering, colors, and size may vary as it is hand made. The Mimi and Popo’s Place grandparent sign is built in our workshop. The grandparent sign is made of four cedar boards. The sign is hand painted with Kilz House Paint and durable craft paint. Then the piece is sealed with an acrylic sealer. 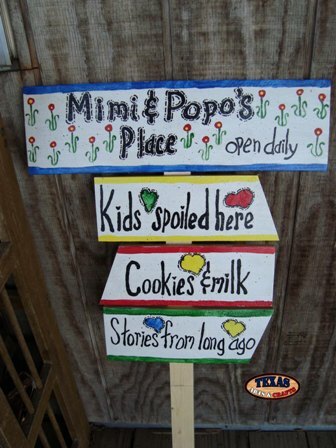 The top board says Mimi and Popo’s Place open daily. The top board can be changed to say anything you like as long as it is appropriate. To change the language please contact us through our Contact Us page. The second board says Kids Spoiled Here. The third board says Cookies & Milk. The fourth board says Stories from long ago. Lettering, colors, and size may vary as it is hand made. 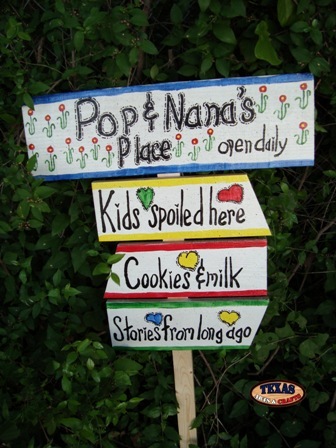 The Pop and Nana's Place grandparent sign is built in our workshop. The grandparent sign is made of four cedar boards. The sign is hand painted with Kilz House Paint and durable craft paint. Then the piece is sealed with an acrylic sealer. The top board says Pop and Nana's Place open daily. The top board can be changed to say anything you like as long as it is appropriate. To change the language please contact us through our Contact Us page. The second board says Kids Spoiled Here. The third board says Cookies & Milk. The fourth board says Stories from long ago. Lettering, colors, and size may vary as it is hand made.